Oval badge for branding. Hard case with carry handle. Skewers. Corn cob holders. 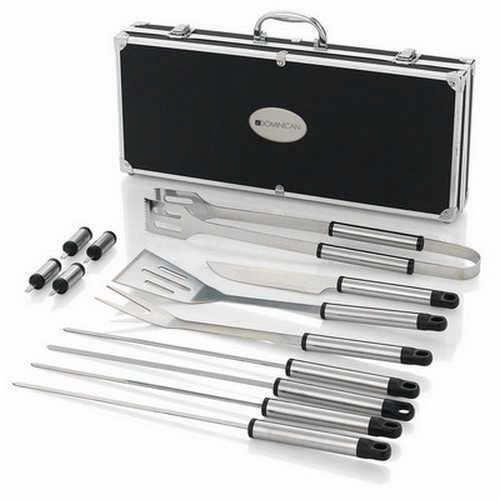 Stainless steel tools. Product Size: 480 x 70 x 200mm. Product Packing: Boxed. Decoration Size: 60 x 25mm. Decoration Position: Branding Plate. Decoration Method: Pad Print | Laser Printing. Carton Quantities: 6. Carton Size: 49.5 x 48.5 x 24. Carton Weight: 13. Colour: Silver/Black. Price includes : Pad Print 1 Colour / 1 Position. Setup is included.